Habco Industries' core business focuses on the design, manufacture, installation, and service of test stands and tooling for OEM production test or overhaul / repair testing of components for the aerospace, automotive, electrical power and power generation industries. Process Automation Software Coding in "C" Language, National Instruments "LabView" and "LabWindows"
The SK2000TC-BS-28 is designed for back shop use and affords added personal protection during tire inflation. It is fabricated from a high strength woven steel mesh that will absorb the energy of a tire explosion or separation and contain the shrapnel to help guard against injury and damage to the mechanic, bystanders and equipment. The cage is designed to stretch and not fracture under tire failure conditions. Five steel bars provide additional strength in the event of a tire rim separation. 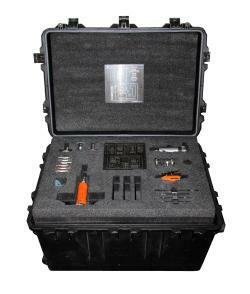 The Composite Repair Kit is able to satisfy a number of repair requirements on multiple platforms and be easily transportable. HABCO's SK2005CRK-CH47 provides all of the tools necessary to prepare adhesives as well as patch or plug skins, panels, and rotors which include routers, sanders, and temperature controllers. Additionally, as an added benefit, HABCO's SK2005CRK-CH47 provides the user with a heat gun, silicone-rubber heat blanket, and a heat lamp that will support most minor repairs. The HABCO Maintenance Crane Model 6408 is designed to assist the crew of the CV-22 Osprey. 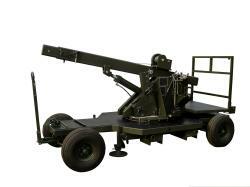 The Model 6408 is designed to lift a 2,000 pound payload to a height of up to 25 feet. 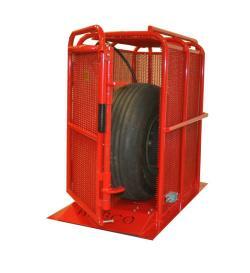 The load can be rotated a full 360 degrees thus allowing ease of cargo loading and unloading. The Model 6408 is compact, measuring 142"L x 64"W x 59"H in its undeployed condition.